Clearly, the Nikon D850 and Z7 have plenty of similarities. In fact, aside from the expected differences between a DSLR and a mirrorless camera, the two cameras are remarkably alike. The Z7 has a smaller, lighter form factor and an electronic viewfinder, while the D850 has a vastly better battery life and an optical viewfinder. Another key difference between the two cameras is storage media – Nikon decided to go with a single XQD memory card slot on the Z7 instead of two memory card slots that we see on the Nikon D850. For video shooters, the Nikon Z7 is also a superior option, thanks to 4:2:2 10-bit recording with N-Log, which is absent on the D850. The only other major feature difference is the number of autofocus points, which favors the Z7, although that doesn’t mean the Z7’s autofocus system is actually faster or more reliable (yet to be tested). Still, not everything is the same. The Z7 has in-body image stabilization (IBIS) that can compensate up to 5 stops, the first time we’ve seen such a thing in a Nikon camera, and that’s a big deal. Considering that it works with adapted F-mount lenses, you now have image stabilization on any lens you own, going back decades. This is a big deal for both photography and video work. Also, the Nikon Z7 has 9 FPS shooting built-in, while the D850 requires a separate grip (adding to the weight and price) to get the same. It is worth stating the obvious, too: these two cameras have different form factors, and they won’t handle in the same way. Aside from the smaller size of the Z7, which leads to a shorter grip, there are many differences in the control arrangements of these two cameras. A big one is that the Z7 has a mode dial with three custom setting options, while the D850 has a button to change PASM modes, as well as menu banks for custom settings. Some of the cameras’ buttons are in entirely different places, too, mainly to accommodate the Z7’s change to right-hand dominant controls. My opinion so far is that the Z7 layout takes the best of Nikon’s consumer and professional DSLR controls and puts them in a single camera. It not only has the joystick and AF-ON button of the D850, but also the custom settings of Nikon’s less expensive DSLRs that many people prefer. Unless there are any unforeseen handling issues with the right-hand dominant controls, I suspect the Z7 will be among the best-handling Nikon cameras ever made. The only issue up in the air is why the Z7 doesn’t have a dedicated AF mode button, like nearly all of Nikon’s advanced cameras do. I suspect this will be an option we can assign to one of the custom function buttons on the front of the camera, but that remains to be seen. Not surprisingly, there are a lot of unknowns remaining about this camera. We still don’t know which autofocus system performs better, and that will take some testing before anything definitive is revealed. The same is true of the 45 MP sensor. On paper, it seems to be the same as in the D850, but perhaps Nikon has been able to improve things over the past year. Even if not, there arguably is not a single full-frame camera on the market today with a better sensor than the D850. A sensor that is just as good would be a definite win. 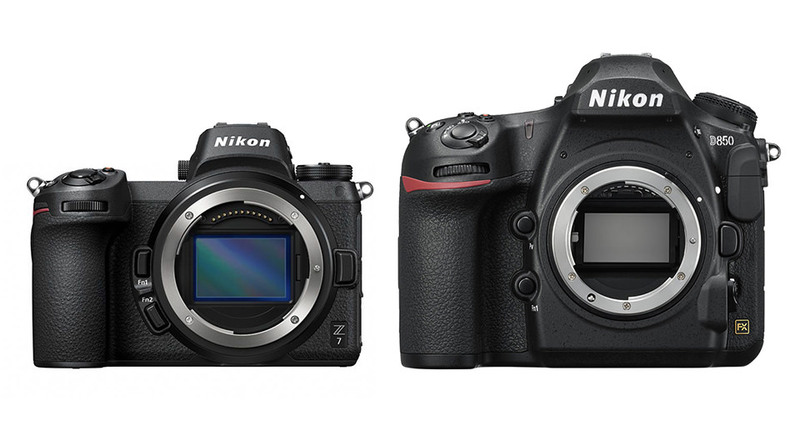 As the specifications comparisons show, the Nikon Z7 is ahead of the D850 in some noticeable ways, although they’re quite close overall. Indeed, I’d say the two cameras are positioned more side-by-side on the market rather than one ahead of the other. Since the D850 currently sells for $3,300, and the Z7 sells for $3,400, the ultimate question is even more important: which camera is the better choice for your photography? As much as I am tempted to say the Z7, given its impressive list of features and specifications, the only real answer is that it depends upon your needs. We haven’t tested the two cameras head-to-head, but it is impossible to deny that the D850 is a field-proven workhorse. It has excellent build, weather sealing, battery life, and usability. The optical viewfinder is large and bright, and it works with Nikon’s huge lens lineup without resorting to adapters. The Z7, in turn, is the new kid on the block: interesting technology (including IBIS), an intriguing form factor, and the first step into Nikon’s next line of cameras and lenses. As much as the F-mount lenses and bodies will continue being supported, I strongly suspect that Nikon will shift more and more of its resources to the Z-mount in the future. Nikon made a big deal out of the Z mount during the announcement, which shows that the company is shifting gear and its resources towards the mirrorless system going forward. Those differences make this comparison a tricky one, and I’m sure a degree of polarization will follow anyone who chooses one over the other. Personally? My trusty D800E is reaching the end of its run, and it’s almost time to jump on an upgrade for my landscape photography. The Z7’s future-proofed mount and impressive technology have swayed me in that direction, and I don’t mind using my F-mount lenses via Nikon’s adapter until the day that replacements arrive. Then again, it is always possible that the Nikon Z7 will have some unforeseen issues, and we still need to test it here at Photography Life before I feel entirely ready to buy it for myself. That’s one advantage of the D850, at least for now; it is a proven camera with amazing performance and very few downsides (even landing as our number one favorite DSLR on the market today). Really, either way, you can’t go wrong. Any word on focus stacking? I’ve read that WiFi can be enabled without needing SnapBridge on the Z7, just like the D750, yay! I’m not sure if that is a yes or no… ? Do you know if it has backlit buttons? It’s missing on the power button dial, unless they’ve put the feature somewhere else. The number of battery packs you have to bring will negate the advantage of using this small body. For $3400, you only get 330 shots per charge. Real joke. The target audience of a bunch of millenials are used to short battery life in all their devices. An omissions of Instagram app on the other hand might really tank this undertaking. Meanwhile I just miss how many shots I could get on a coin cell back in the days. Actually, it’s not a smaller battery. It’s the same as the D850–the EN-EL15a . I talked with a Nikon rep at my local camera shop a couple weeks ago where I held and shot with the camera and she said that the field tests were consistantly getting well over 1000 shots on one battery charge. Who knows–she could be blowing smoke. Mine Z7 is arriving tomorrow and I have a family wedding next week so I’ll know quickly. I’ll report back. Awesome can’t wait to here about your wedding adventure with the Z7. I am leaning towards the D850 still, now have the D800. Here’s to a great success with the wedding. Looking forward to seeing a few photos. Thanks for sharing. Patricia, how is the Z7 performing for you? How many shots per battery charge are you seeing? Mirrorless camera batteries should not be judged solely by number of shots, as that can be very misleading. Their biggest power draw is reading 60+ fps from the sensor and displaying it on the EVF & LCD, not the act of taking a picture. The real question is how long the camera was simply on and showing an image in the EVF/LCD. Funny, most people who have actually used it are reporting 1500 or more. I’ve heard the same thing. Of the problems the Z7 may have, I’m betting battery life will not be one of them based off of people that have been testing preproduction models. The terrible battery life is the only reason that I will keep the trusty D800. I don’t mind the adaptor, but $3500 and carry 3 to 4 batts is out of the question for me. Will wait for the Z8. I have a collection of f mount lenses. Do you think its worth holding onto them and using the adapter? Or is it time to sell before the bottom falls out the market? Is highlighting omission in “Pentaprism / OVF” international? One would look at the chart, battery life alone is a no go, especially since the mirrorless drains it just for being turned on. I pre-ordered the Z7. This is a nice camera spec wise, and is very similar to my D850 in a smaller package. The biggest disappointment though is the abysmal battery life. The battery life of the mirroless cameras (Sony A series) is what has kept me from going mirrorless. It’s disappointing Nikon couldn’t improve the battery life on the newly announced mirrorless cameras, From my perspective that is the biggest flaw (one card slot too). It almost made me reconsider pre-ordering this camera. I don’t know if I’ll keep it, but I at least want to try it out to see if it will work. Agreed, and although the Z may use the 15 and 15a batteries (with limited performance results) the included charger will only charge the included 15b battery (per Nikon specs). I’ve decided to stick with my D850 and the primary reason comes down to lenses. I’m mostly a wildlife shooter mixed with some macro and landscapes. The lens road map for the Z series does not contain anything above 200mm. So why would I get a Z series camera only to use my existing telephotos with the adapter? Another thing, we’ve been told that the high megapixel cameras need very good glass which to me translates mostly into newer lenses. Most of my lenses have VR so IBIS is less valuable to me. Focus peaking through the viewfinder would be nice, but not necessary. Also note the low buffer on the Z7. I see no reason to move. Thank you for your insights. This is very helpful. Just asking, but would you spend $3,400 + on what is something very new for Nikon with very low battery life and other limitations (200mm max on lenses, 1 card slot). I get the weight and size benefits but I like the size of my 700 & 850 – the Z7 almost looks too small. Time will tell. Maybe the Z7S in 18 months time will address the lack of a 2nd slot and better battery life. 1) If you add in the weight of the lens mount adaptor, the total weight of the Z7 body (for use with F mount lenses) appears to be about 722 grams compared to the D850 body at at 915 grams. This is not a big deal (at least for me), but I just wanted to point out that if you are shooting F lenses on the Z7, the “effective” or useful weight of the Z7 body is somewhat closer to that of the D850. Note: This was based on the best adaptor weight Information I could find right now. I could not find an official weight rating in Nikon’s tech specs so I used a number (136 grams) I found in an online review. If you have a different/better number, please let us know. 2. I totally agree with your comments about IBIS being a big deal. I have several F mount prime lenses which produce outstanding image quality on the D810 and D850, but they are not stabilized. I don’t have the steadiest hands out there, so if I could shoot hand-held with my primes and get near tripod stabilization, that would be a game changer for me. Spencer thanks for the article. I must admit I’m not sure of your reasoning for upgrading your D800 to the Z7, but not to the D850 when it came out. I have to be honest, I don’t think it makes sense for a D850 stills user to be interested in the Z7 at present. There are some serious disadvantages here. 2. 8fps at 14-bit RAW vs 9fps D850 (with grip). This may improve with a Z7 grip though, but even this isn’t out until next year. 5. Looking at the S-line lens line up and future roadmap, the FTZ adapter will negate the weight benefit and may affect AF and image quality (despite whatever Nikon may state, extra glass elements may do this). The S-line 14-24mm 2.8 Lens isn’t due for a few years. 1. Improved AF coverage. But how much improved the hybrid AF itself, if at all, this will be over the D850 remains to be seen. And no DSLR AF modes. 2. Image quality may well be improved if indeed it is a new sensor. I shoot a fair amount of landscapes (with a D850) and for someone with F mount lenses, within the context of the 3 S-line lens line-up, I would have thought there would be too many cons to move to a Z7 at this time. Why did you feel the Z7 was able to convince you, but not the D850 wh n it arrived? I’m probably missing something though so would be interested to hear your thoughts! Apologies it should read “5.5fps at 14-bit RAW vs 9fps D850 (with grip)” as mentioned in the Nikon technical specs. I also of course forgot to agree with you and mention IBIS as a huge advantage of the Z7. Concur w/ UR assessment. D850s will incorporate the few Z7 improvements by Spring 2019,, maybe…?? It could be just me – but both Z7 and Z6 build looks cheap. They are more like prototypes than cameras. Simple rectangle boxes with straight corners. It is not minimalistic elegance like Leica – it is just a cheap rectangle box with the lens and grip attached. The grip looks totally foreign on that body. These two camera look like ugly ducklings to me. Hopefully, they evolve into the swans one day. Based on paper, the 50/1.8 lens looks attractive. I have a D810 and D850 on order … so when I saw this announcement I thought the timing couldn’t be better – now I could instead go with the latest … until I found out it was far from being the greatest. But reading the specs on the Z7 sold me on getting the D850. They produce a mirrorless camera and the speed is identical? I’d expect the lack of a shutter going up and down would translate into at least double the FPS, but it is the exact same (I always use the grip). I find my existing cameras too small for my hands, so I have the grip on them at all times. Plus with my large lenses, it is just too unbalanced to have a little camera on the end. The Z7 would be even worse. If they had come out with a mirrorless F-mount body that was the size of the D850, they would have had a huge hit. This is the most disappointing Nikon announcement ever. Thanks Nikon for making my decision to buy the D850 so easy. The most disappointing announcement ever? Please. I thought it was pretty exciting and the Z6/7 look like an awesome piece of kit. The grip is actually quite deep on the z7, but having one in hand, I am thinking of selling it for a d850.. I wonder why the sensor size looks different in the picture with this artical? The D850 and the Z7 have the same sensor. You’re looking at the mirror in the D850. Reflected in the mirror is the focusing screen. I am hoping the adapter works well with Tamron lenses. A little over a year ago I traded in my Nikon wide angle for the superior in sharpness, Tamron 15-30. For wide angle landscape shot it’s my favorite lens, it would be a real disapointment if it didn’t work well with the new adapter. I would add that the Z7 is ahead of the D850 in the video department. It’s a different story for stills. The Z7 is a no brainer for people who are still on D800’s. The Z7 with its Z mount is better future proof. And I guess the image quality will gain from that new mount as well. I read that Nikon will add firmware to support CFexpress in the Z series. I wonder if that will happen to the D850 as well? For some strange reason I believe the XQD format will not have a long life. There are only 2 manufacturers today and some leading memory manufactures have said not to adopt XQD. Therefore, I’m curious if Nikon will provide a firmware update for the D850 to support CFexpress cards. I would tend to agree with your comments about the D800 vs Z7, except for the Z7s size; I can’t see how I could comfortably use it. I’m retiring my D800 as well, looking to either the D850 or the Z7. As much as I like what I’m seeing about the Z7, its size is still a major drawback to me. Even the D850, without the grip is a bit too small for my tastes. Wondering if there will be N-log available for the D850? There are a few home made ones out there. Atomos is now supporting it so it would be great to have that for the D850. (8bit vs 10bit though)? Witam wszystkich serdecznie planuję kupić aparat do robienia zdjęć na wesela studniówki chrzciny idt. Proszę o opinię który aparat wybrać Z 7 czy D 850 Czytając to wszystko zbiło mnie z tropu ilość zdjęć na jednej baterii w Z 7 trochę mało proszę o opinie. Pozdrawiam wszystkich.. Yes, thank you for…but i choice D850 . The terrible battery life is the main reason that I will keep the trusty D800 for another year (or two) I will wait for the Z8. I don’t mind the adaptor, can deal with the crapy buffer, and other misses, but $3500 and carry 3 to 4 batts is out of the question for me. As a Nikon guy of 39 years, I’m very disappointed with the new small body. I had wished for a D850 with mirrorless with a better sensor. I think Nikon screwed up a chance to become the undisputed king. i have both the D850 and Z7..honestly,,im not sure about the z7 yet..I love the the focus on it for landscapes. I love the lighter weight compared to the 850. But, not crazy about the 24-70 lens and when you put the F-mount lenses on it, there is not much difference in weight. I love the ability to program all custom functions in one setting, similar to canon. I hate the menu banks and extended menu banks. Thats just insane to me..Oh,,and putting the tripod mounting plate on the z7 prevents the adapter from being removed and vice versa..I have a new velbon pano head and when the mounting plate is attached to the FTZ adapter, that adapter interferes with the removal of the adapter. So you cant switch easily from the 24-70 Z mount lens to a F-mount lens with the adapter. I love the remote shutter plug..thats easy but does come loose easily also on the z7..I cant figure out how to keep my the electronic viewfinder from shutting off so quickly, but if you dont then it uses up battery life quickly…..
With regard to battery life and the EVF of Mirrorless cameras compared to DSLR’s; battery life with the Mirrorless camera is going to be affected by the Need to power the EVF. One of the things I like about my D850 is the ability to use the optical viewfinder to see a very clear image, while framing/composing, without need to use more battery power. On the other hand, I have also been using a Fuji X-T3 and really like having the EVF with extensive and customizable info, including full time level and histogram display while shooting. It does eat power, though, even with the eye sensor that turns the EVF off when your eye is not against the eyepiece. For the most part, for landscapes and most static work, I use my D850 very much like a Mirrorless by setting up using the OVF then switching to Liveview perfecting focus, setting and checking exposure and using the live histogram, and actual shooting. Seems like the best of both worlds.